Baby, it’s cold outside! Winter definitely has come a-knocking… And with it, I’m already seeing an upsurge of colds and flu all around. Luckily, I’ve come into the season fully prepared – beating cold with hot! Ice with Fire! Fire Cider Tonic, to be exact. This tonic brew is also known as Cyclone Cider, or Master Tonic, and is a folk medicine of old, made popular again by herbalist, Rosemary Gladstar in the 1970s (and when using the actual name “Fire Cider” in commercial settings, it is also the center of huge trademark disputes… which I don’t really want to go into, suffice to say it is a cider based tonic and it is fiery). 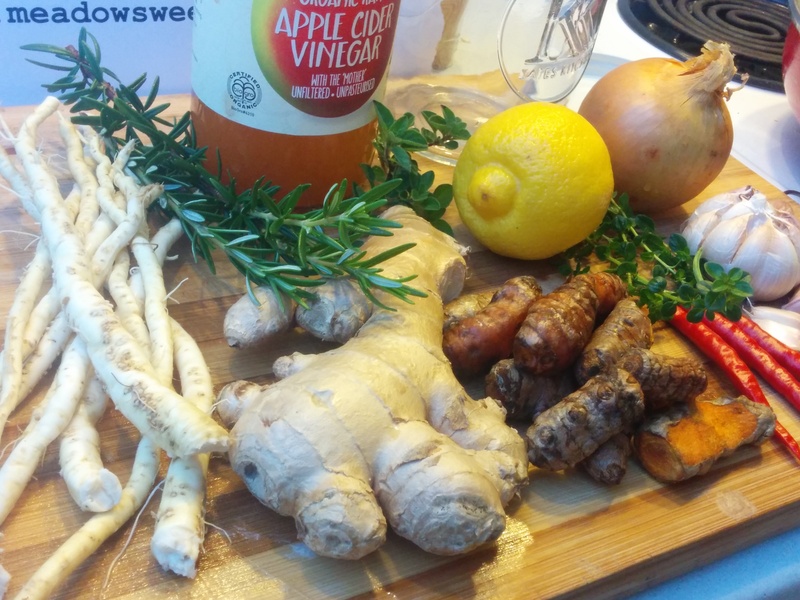 Essentially it is simply an infused vinegar packed with herbs and spices to make it a powerful immune-boosting, anti-inflammatory, anti-bacterial, anti-viral, and circulatory tonic. There are quite a few variations on the original recipe, and it is easily adaptable to what you have on hand, and the quantities used are also not set in stone – adjust it to your tastes, your heat level tolerance, and the ingredients you have easy access to. Keep in mind though, the healing properties, and the interactions between all the different herbs and spices. 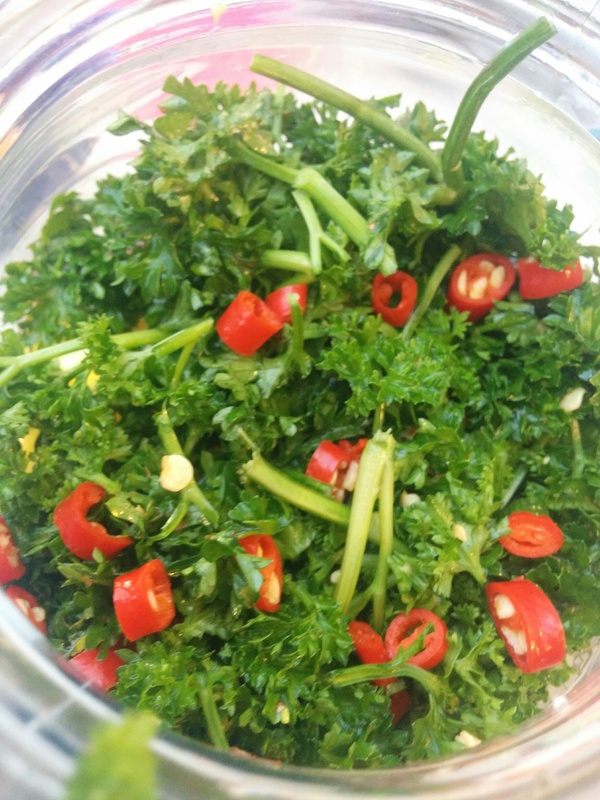 As I mentioned, the above ingredients make a good base, but you can be quite flexible – add different fresh herbs, e.g. rosemary, oregano, or even lemon balm or nasturtium leaves. Dried herbs and roots like elderberries, cinnamon sticks or Echinacea root can also be beneficial in the tonic. Place all the herbs and spices in a 2 liter jar, and cover with raw, unpasteurized apple cider vinegar. Be sure to cover the herbs by at least few mm, then cut a square of parchment or wax paper and cover the jar before tightly capping it. Store in a warm (but not full sun) place for a few weeks, shaking the jar daily. After three weeks, your tonic is ready, but it can sit for a few more weeks to get really potent. Some herbalists let it steep for months before straining. Add warmed raw honey to taste (around a 1/3 cup is good), mix thoroughly, and bottle. Although it doesn’t strictly have to be refrigerated, I like to keep my cool. Take a tablespoon a day as a preventative, or when fighting an infection, you can up the dose to 2-3 tablespoons twice a day. 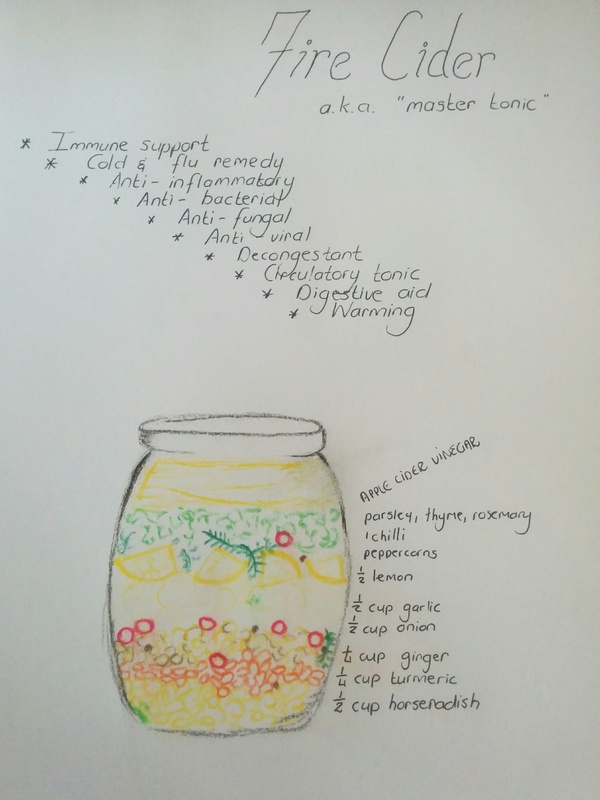 There’s a lot of interesting ideas on how else to use it, although I’ve not tried any of them – make a salad dressing with the tonic as a base, add to herbal teas, or juices, and I’ve even read that someone used it as an analgesic rub for sore joints!